Interested in taking lessons with Donaven W.
Born and raised in Milwaukee, Donaven Witt has been active with music since he was nine years old. 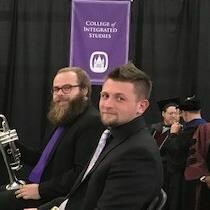 After pursuing Music Education while studying under Dr. Frank Hanson at the University of Wisconsin- Whitewater, Donaven decided it was time to make a change and enlisted in the United States Marine Corps as a member of the Fleet Bands. While there, he held the positions of Trumpet Instrumentalist, Music Librarian, as well as one of the Assistant Conductors. Within 4 years Donaven has traveled to American Samoa as well as the Kingdom of Tonga, in addition to several states performing all different genres of music for audiences on a regular basis. He is a classically trained musician with an active presence in ensembles of varying styles, such as a New Orleans Brass Band, Afro-beat, Jazz, Chamber Music, as well as other Classical Ensembles. Request Lessons with Donaven W. today!